That explains why the fan was there in the first place. Intel's Compute stick could get a Core M upgrade. 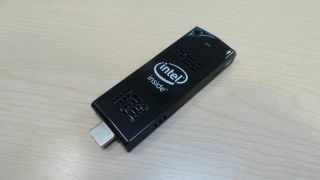 Intel's Compute Stick attracted its fair share of criticism when it launched because of its underpowered (but crazily affordable) Bay Trail-based Atom processor, the Z3735. Now, a spokesperson for the semiconductor company has confirmed that future iterations may well include Core M processors, similar to what powered the Lenovo Yoga 3 Pro. That helps explain why the Compute Stick had a fan stuck in despite the fact that other similar products (tablets, dongles or computers) used a passive heat dissipating setup. The Core M dissipates about twice the amount of heat of its Atom counterpart. A Core M processor will certainly improve the device's compute and graphics performance. Intel will, however, almost certainly need to cut prices as it is an expensive part, costing more than twice the current Compute Stick on its own (and roughly 17x the price of the Atom Z3735 that powers it). Check out our review of the Intel Compute Stick here.